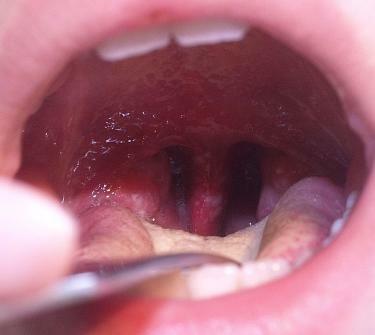 If you’ve ever had a cold, strep throat, or even allergies, you’ve probably experienced the discomfort of a sore throat. Sore throats are a pain for everyone, and when you have strep throat blisters, ulcers, or other sores in your throat, your discomfort level can go from bad to worse in an instant. Because a variety of viruses and conditions can cause a sore throat or sores on the back of your throat, it’s important to be aware of what to do when you find yourself with telling symptoms. Most commonly, a sore throat with blisters or ulcers is due to a virus called coxsackievirus. Coxsackievirus causes a wide variety of symptoms, and while it typically affects children, adults can get it as well. Hand, foot and mouth disease – Hand, foot, and mouth disease is a viral illness that typically affects children under 5 years old; however, it can sometimes occur in adults. Symptoms include fever, mouth blisters, and a skin rash. Herpangina – Herpangina is a contagious childhood throat infection that causes blisters and ulcers on the tonsils of the roof of the mouth. Coxsackievirus is highly contagious, but children and adults often recover without treatment within a few days. Coxsackievirus isn’t always to blame for a sore throat with ulcers or blisters. Sometimes sores in the back of the throat —white patches or red patches due to a virus like mono or bacteria like strep throat can be mistaken for these same symptoms. The only way to know for sure is to visit your local FastMed Urgent Care and be seen by one of our caring medical professionals. Once we determine the cause of your sore throat and blisters or ulcers, we can provide you with treatment to have you on your way home and feeling better in no time!